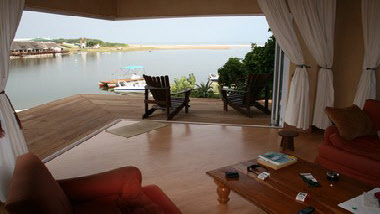 We offer a four bedroom all en suite house on the river at Mpekweni. Open plan lounge kitchen and dining area. Separate scullery. The house is fully equiped with luxurious finishes, crisp white linen, good quality cutlery and crocery, dstv, steamroom, the river is your swimming pool and great for skiing. The unspoilt beach on the Indian ocean allows for great rock and surf fishing. Golfing and game viewing in the vicinity. The house will be fully serviced. The perfect holiday get away.